1. Focus on the risks that are the most crucial to the future of the enterprise. While boards should serve to rein in the “cowboy CEO,” they often are much more timid and rein in any form or shape of risk. “Boards often lack the intestinal fortitude for the level of risk taking that healthy growth requires” and ironically, this timidity increases with organizational growth and capacity. Young organizations are more flexible, courageous, and bold. Why avoid risk? Surprisingly, it seems that boards “too often put self-interest and self-preservation ahead of shareholder interests”—translated into the non-profit world, they care more about their seats in the boardroom than they do about the audiences they are supposed to represent and serve. “You need to make sure both management and the board are always focused on long-term shareholder value.” Of course, that means you all agree on what improves value or increases impact. Most museums and historic sites rarely consider outcomes or impact because they’re too focused on preserving, collecting, and interpreting, confusing the means for the ends. 2. Do your homework. Board members not only need to be prepared for the meetings by reviewing the agenda and materials in advance, but understand the workings of the organization and the field in general. “If you don’t take the time and effort to learn the business, I can’t really have a dialogue with you,” said one CEO. CEOs are responsible for keeping their boards informed beyond the distribution of minutes and agenda—it’s hard to maintain continuity of thought between meetings. Sending updates between meetings can be helpful but it’s important that it not be overwhelming nor that it be too formal and time consuming. Secondly, some big decisions requires extra time so the board can conduct due diligence and deliberate. With key decisions, don’t present an idea and ask for resolution in the same meeting. Let the board know your thoughts and allow for conversation and discussion. Former CEOs who can be disruptive by getting overinvolved in management and acting in ways to regain a lost sense of power and glory. Anyone interested in serving as CEO should step down from the board—that’s an inherent conflict of interest. “Celebrity directors,” such as movie stars, famous musicians, and elected officials. Although they’re supposed to contribute “star power,” ironically these “celebrity directors” have little impact on overall corporate image. Instead the “celebrity director” increases his or her prestige and social standing by saying they’re on your board. “Professional directors,” retirees who rotate among boards but aren’t actively involved in the field. 4. Do more to challenge strategy constructively. Thoughtful discussions and debate are often missing in meetings because of the natural tendency to avoid conflicts. As one CEO mentioned, “In the boardroom, the thinking is: You have to be equal. Don’t be overwhelming or dominant, don’t hurt feelings, and don’t take someone’s chair. It’s all about getting along.” The result is that discussions occur at the watercooler or in the parking lot, where they can’t be compared or integrated with other views in the board meeting. A way to overcome these tendencies is to ask probing questions (rather than just stating opinions), focus on current decisions and future issues (rather than rehashing past mistakes), and police one another if there’s a disruptive personality (something that’s nearly impossible for the executive director). 5. Make succession less, not more, disruptive to operations. Succession planning can inflict profound damage if not handled in an orderly fashion. Leaders should consider rising talent within the organization equally with external candidates and be wary of making an intemperate decision to oust an executive director without a group discussion. Figure out the process first (in a neutral situation, without consideration to specific individuals and before its needed), then apply the process when appropriate. This eight-page article would make good reading for non-profit board members, either as part of the packet for a regular meeting or at a retreat to assess the board’s current performance. It’s available online at HBR.org. 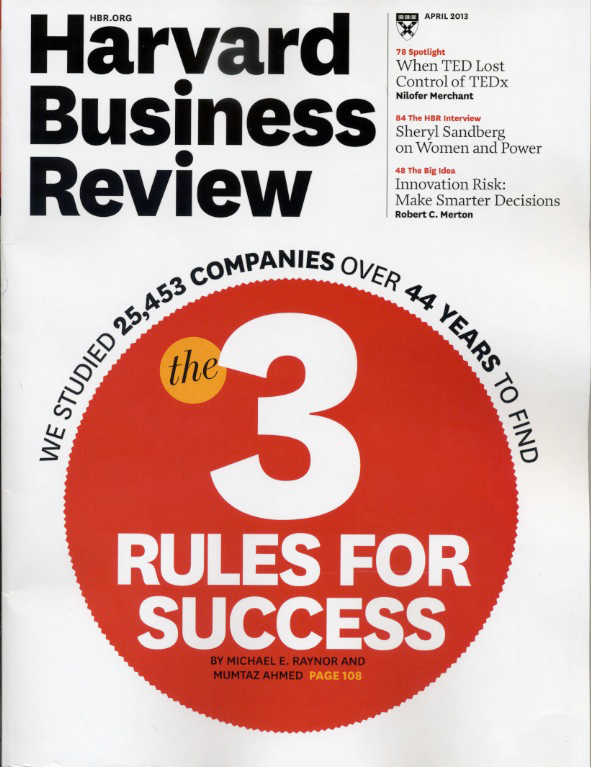 This entry was posted in Governance and management and tagged Harvard Business Review on May 7, 2013 by Max van Balgooy.